James Harden ties his career high in points as the Rockets narrowly escape an inspired Spurs comeback attempt. James Harden is a professional scorer. He’s going to take difficult step-back three-point jumpers and a lot of those difficult shots are going to drop. He’s going to drive into the paint, throw his body at defenders to create contact, and he’s going to get some foul calls. It’s frustrating to watch, but it’s going to happen. What teams cannot do is add fuel to the fire by playing undisciplined defense against the Houston Rockets’ incredibly predictable yet eminently productive offense. But just as memorable was the overall team defense played against Harden. They kept their hands up, refusing to fall for Harden’s moves he uses to draw cheap fouls. The team had defensive discipline down to an art form. Other than one Davis Bertans’ defensive possession (which ended in a missed Harden basket), I did not see any of the Spurs implement this tactic in the first half of Friday night’s game against the Rockets. Instead, they continued reaching and getting their hands caught in the cookie jar. Harden was fouled not once, but twice, from the three point line in the first quarter, and ended up being fouled a third time later in the game. That just cannot happen if the Spurs expect to win a tough game on the road. Harden ended up outscoring the Spurs 27-24 in the first quarter. Those first quarter points by Harden tied him with D’Angelo Russell for the most points scored in a single quarter, and his 37 halftime points was the most points the Spurs have allowed a single opponent to score in franchise history. To make matters worse, LaMarcus Aldridge went scoreless in the first half, DeMar DeRozan scored five points, and Rudy Gay spent the majority of the game in foul trouble. Unsurprisingly, the Spurs entered the second half down 47-62. That lead was extended to 19 early in the third quarter, but then seemingly out of nowhere, the Spurs started to play inspired defense. There were more hands up when guarding ball-handlers, and the Spurs tried to force players other than Harden beat them. Good defense always seems to lead to good offense, and both DeRozan and Aldridge started to get on track. After a couple Jakob Poeltl offensive put-backs to end the third quarter, the Spurs had completely erased their 19 point deficit. The game was tied at 81 to start the fourth quarter. After this call, the Rockets came out of a timeout only to have Harden fumble the ball in the paint, get the ball back, and hit a three pointer to bring the Rockets to within three points of the Spurs. This whole sequence was of the most frustrating moments I’ve felt watching basketball in a very long time. It’s hard to describe how disappointed I was at that call. Suffice it to say, I’m very surprised I did not receive a noise complaint from my neighbors. DeRozan clearly goes straight into his shot, barely grazing Harden’s beard along the way. The only reason DeRozan made contact at all was because Harden’s unnecessarily large beard was in his space. I’m not typically a fan of slowing down the game even more, but it’s at times like this that I wish these kinds of plays were reviewable. People will argue that calls like this are subjective. I disagree. DeRozan either extended his arm to elbow Harden in the face or he didn’t. Besides the short term consequence of having DeRozan’s basket waived off, it led to several questionable decisions by DeRozan to end the game. He was clearly frustrated after the foul call, and then resorted to the dreaded hero ball. DeRozan ended up going 1-5 from the field over the span of two minutes, getting blocked three times along the way. This is DeRozan’s second straight game of making questionable decisions down the stretch of close basketball games. If abandoning the offense is what DeRozan wants to do late, it would be better for Derrick White to handle the ball in these situations. DeRozan’s inability to score down the stretch coupled with the Spurs reverting to their first-quarter defensive lapses allowed the Rockets to go on a large run to end the game. Overall, the Spurs put together a strong second half effort that came up frustratingly short. The Spurs’ next game is on Sunday against the Celtics in Boston. It is going to be another tough game, but the Spurs are going to have to learn how to win on the road if they wish to make it out of the first round of the playoffs. Tipoff is at 6:00PM Central. Harden tied his career high of 61 points. 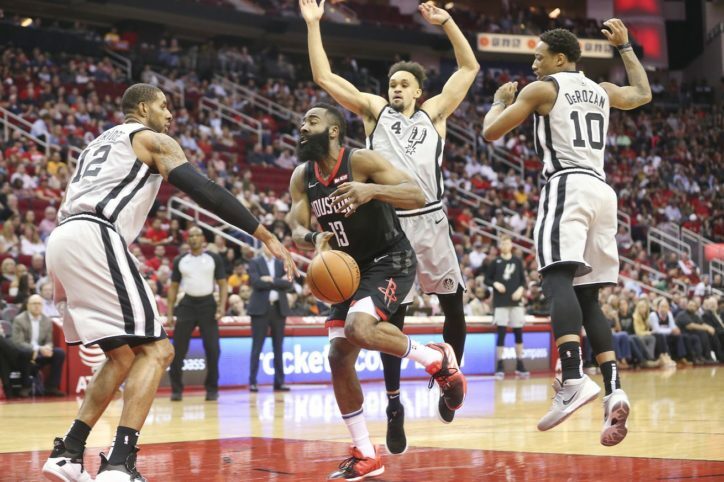 Harden and Eric Gordon are the only two players who the Spurs should be focused on covering on defense. Chris Paul can do damage at times, but he’s nowhere near the offensive threat he once was. I think the Spurs could figure out the Rockets in a seven-game series, but there are other teams I’d prefer to see in the first round. Poeltl only played 17 minutes this game, but he made those minutes count. He had a team-high +/- of +5 (not including Lonnie Walker IV), scored eight points, and brought in eight rebounds, including the aforementioned two put-backs to end the third quarter. Pop had been playing both Aldridge and Poeltl together regardless of the matchup, but he seems to be wavering a bit in his decision. More Poeltl please. Speaking of Walker IV, he got some burn to end the first quarter/start the second quarter. He was aggressive on both sides of the ball, and in my opinion, really made a positive impact at a time when the Spurs desperately needed somebody to step up. How much I loved watching him out there, we gotta be honest with ourselves. If the Spurs are playing Walker in the first half a game this season, something has gone terribly wrong. Somebody please recalibrate Davis Bertans’ Latvian laser. He went 1-10 from distance against the Rockets, and several of those three pointers could have led to a Spurs victory. Bertans has now made only 17 of his last 63 shots from three over the Span of 13 games. The Spurs’ team three point percentage has suffered as a result. They will need him to start hitting those shots if they are to make any noise in the playoffs. Speaking of playoffs, tonight was not a good night for the Spurs. The Oklahoma City Thunder came from behind to defeat the Toronto Raptors and the Los Angeles Clippers narrowly got by the Cleveland Cavaliers. The Spurs dropped from 6th to 8th in the Western Conference standings after tonight’s results. Better days are ahead.